In the early seventies I was assistant manager at Swansea Depot and during my time there we employed two young sales representatives, John Rees and Tom Wells, I lost touch with John Rees but have exchanged Christmas cards every year with Tom since I left Swansea in late 1971, this year I received a slightly larger package it contained a few pictures that he had found in his loft. First picture is the Gottwald 500 tonne capacity crane when it was on display in Bath during an open day, at the same time the two new Grove 70 ton capacity cranes with the new trapezoidal boom were also on display with a new 22 ton Grove Rough Terrain crane, Tom sent these pictures together with pictures of the seventy ton Grove working at Pontypridd for British Rail and one of a 30 ton Coles placing a foot bridge at Pontypridd again for British Rail, the final picture was of a new NCK Atlas working at Tredegar on a contract for Birmingham depot, the Atlas was a two man crane at the at that time and my memory tells me that the operators were Ivor Sewell and Alan Morris. Found these pictures recently of Geoff Butler who worked under Tony Allen the group safety manager at the time, Geoff is seen here working on the dynometer of a Manitowoc 4100 under test at Sparrows Bristol. Depot. 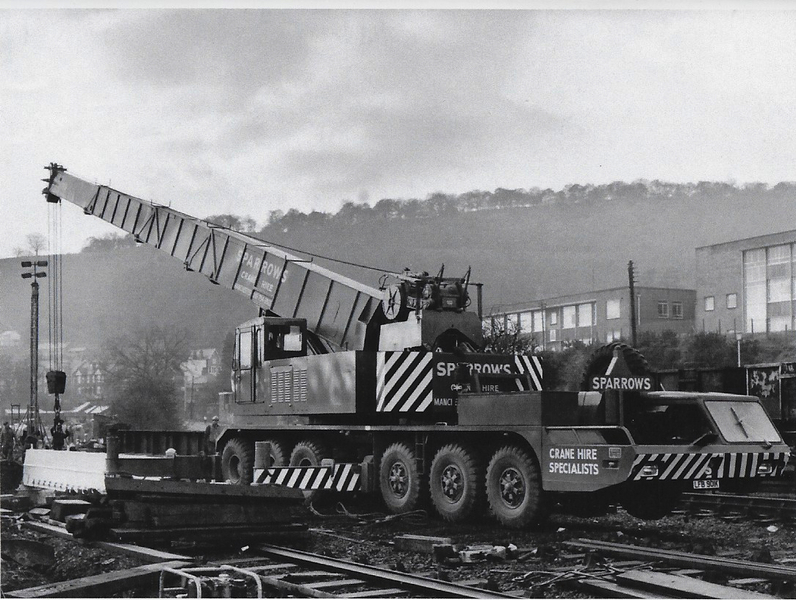 Received this old picture from Dave Barnaby today of the100ton Centurion and the 70 ton Lorain removing the railway viaduct at Lydbrook in the Forest of Dean, Dave thinks it was about 1965. 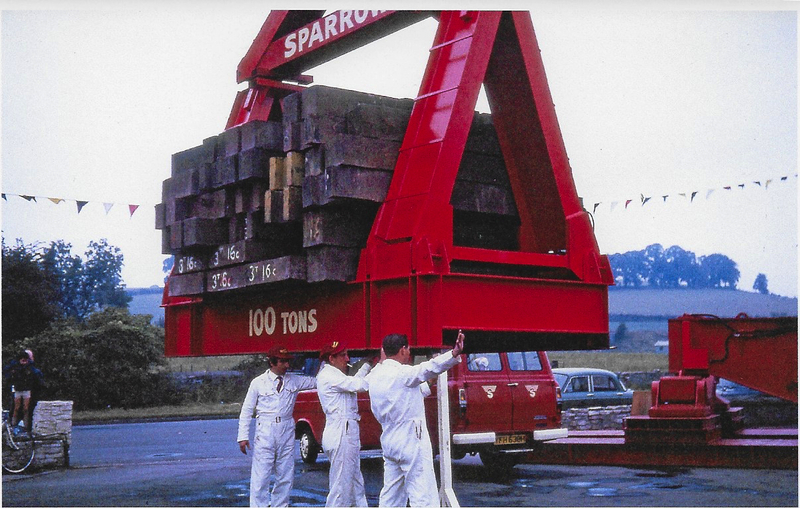 Allan Swan, one of Sparrows oldest employees sent me some interesting pictures recently, Allan started work as a crane operator with Sparrows at Teeside in the early seventies when Brian Hurley was depot manager there. Brian was the first Sparrow Manager for Rezayat Sparrrow at their Dammam base. 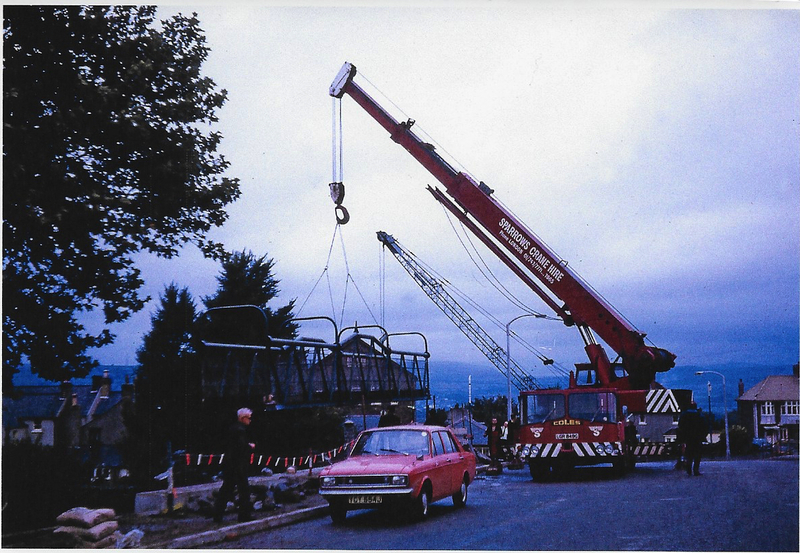 When Brian moved to Damman Allan moved with him as one of Rezayat's original employess, this was the very beginning of Rezayat Sparrow Arabian Crane Hire. Rezayat Sparrow had the contract to offload from ships at Dammam port and load on to local transport over one million tons of cement for distribution all over Saudi Arabia. To service the contract Sparrows supplied and maintained 40 fork lift trucks and several small cranes, together with a new workshop and all the necessary staff and equipment to maintain the machines on a 24 hour basis. After returning to the UK on completion of his contract with Rezayat in 1975 Allan joined Sparrow Offshore, at that time Offshore was a relatively new division. Allan became one of the first fully trained crane operators to work on the North Sea production platforms. Allan still works for Sparrow Offshore and retires in April this year after completing 41 years with Sparrows. A new record for long service with the company. Rezayat Sparrow Arabian Crane Hire still operates over 100 cranes the middle East from its Dammam base. Sparrow Offshore employs over 2000 employees world wide from its Head Office in Aberdeen. Allan and George Buckley in the cement stacking area, over one million tons of cement were handled duirng the contract. A truck loaded with cement leaves Dammam port.. The 1000 tonne Gottwald lifting a 280 tonne section at Birkenhead, a good view of Liverpool Cathedral in the background, picture courtesy of Dave Barnaby. 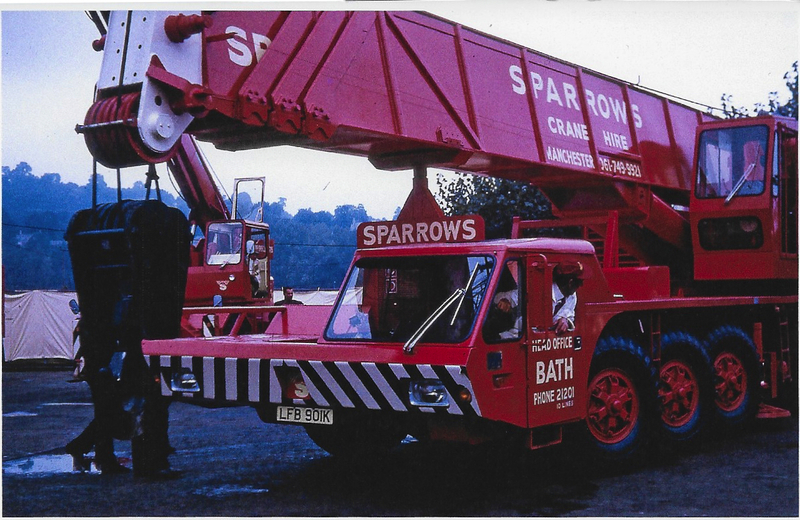 Heard from Christine Hinds a relation of Reg Hinds that Reg had passed away a few years ago Reg worked for Sparrows out of Bath depot for several years both as a crane operator and truck driver, Reg was one of those always ready to help, RIP Reg. Dave Barnaby sent this picture that he took of George and me on the company aircraft, we had been to visit a oil rig construction yard in Inverness. The Gottwald 200tonne capacity telscopic was used to rig the Demag CC4000 at Berkerley Power Station, pictures courtesy of Lynne Berry, Burnham on Sea. 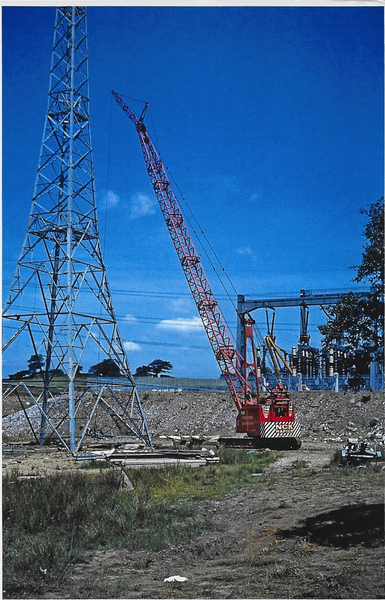 The Demag CC4000 being rigged at Berkeley Power Station (Circa1982/83) operator was John Maclean. The Gottwald at Leith, Picture's courtesy of John Maclean. John is currently working in Colombia for Mammoet USA. (As at April 2014). An AH & D 9310 working at Leith in Scotland tailing down a vessel with the Gottwald 1000tonne crane, Brian Peircy was opertaions manager on site with John Jenkins operating the 9310, John Maclean and Norman Small are on the Gottwald. The 1000 tonne Gottwald and a 9310 lowering a vessel at Leith. The CC4000 finishing of at Cammel Laird after the 1000 tonne Gottwald had left, the CC4000 is swinging a 40ton Kato to the rear of the platform, John MacLean was the operator at the time after returning with the CC4000 from Brazil. Another picture of the Gottwald movement at Hartland Point. Courtesy John Maclean. This shows the amount of planning that took place for each individual lift, and the expertise of all those involved. Thanks Tony I had not seen these pictures before. Received these pictures from Tony McMillan in New Zealand, they show the 1000tonne Gottwald being moved between lifts. 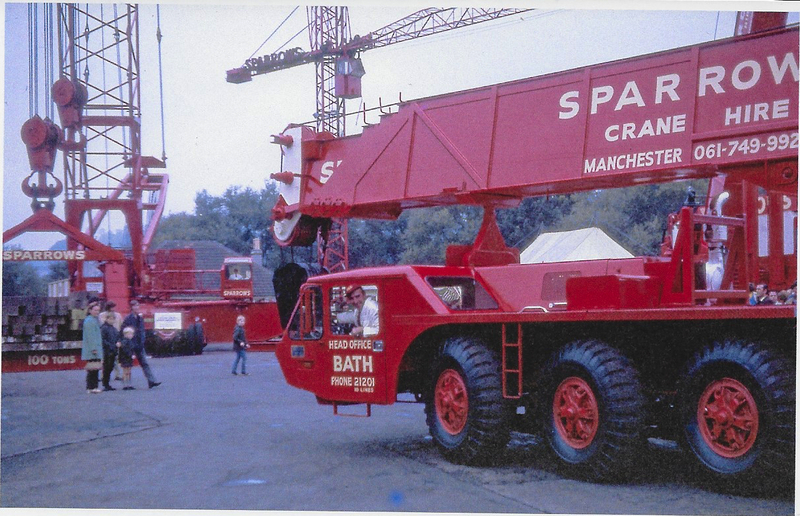 Jeff’s original interest in the industry came whilst passing Sparrows head office at Bath, when he spotted cranes in the yard displaying Sparrows red livery. said to her, “I would love to drive one of those”. 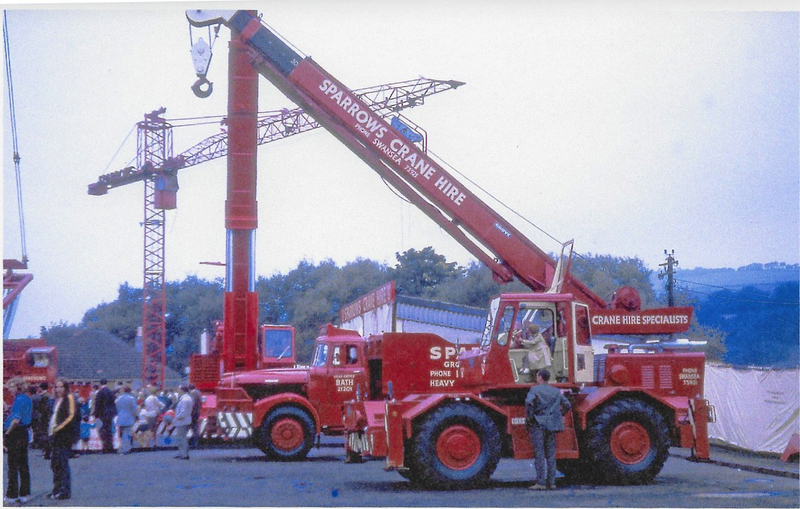 Eventually Mary prompted him to apply for a job with the company, known then as Sparrows Crane Hire, his application was successful and he started his training at Avonmouth depot . . . and eventually Jeff and Mary married. During his first week he worked as second man on one of the large cranes working at the Avonmouth Smelter. After his training period ended he operated a Ruston Bucyrus 22RB. Jeff’s experience flourished as he operated various other cranes before moving to the Bristol depot, managed by Roger Berry. During his time at Bristol Jeff’s progress and experience was recognised and he became responsible for the operation of a 50-ton Coles. Jeff recalls several of the names of his former colleagues at Bristol: Paul Netherwood, Chris Sampson, Pete Van Meir and Bob King. 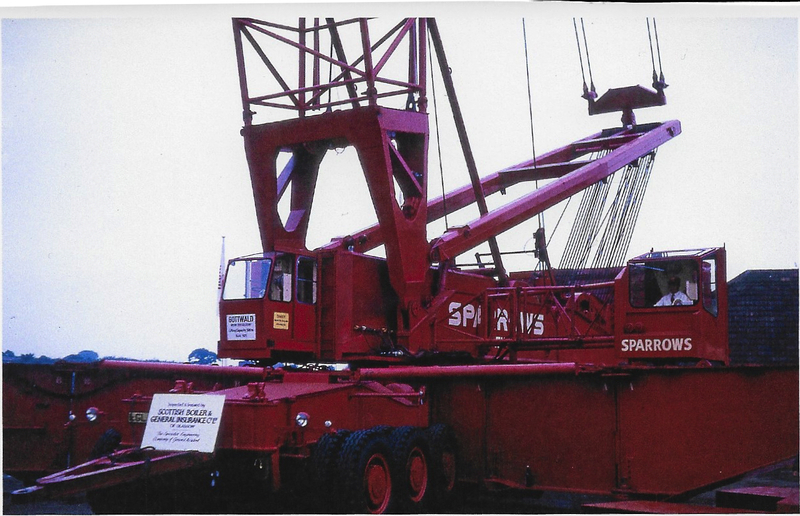 During September 1975 Sparrows began recruiting operators for a new Division “Sparrows Offshore”. Angus Lyon was appointed general manager (he was later to become managing director) and the division was to be based at Aberdeen. Later arrivals from the London depot were Joe Rock and Bill Cutler. However, most of the initial operators were recruited from the West Country. A temporary office was established within the offices of Tubascope, Greenwell Road, Aberdeen. Jane Smith, a local girl, was appointed operations manager. North Sea, proved to be invaluable. The first offshore platform that Sparrows operated on was the Forties Alpha platform, built by the Laing consortium at Graythorpe. Sparrows supplied many cranes and engineering services at this site for Laing, including the 500 tonne Gottwald. Jeff’s offshore career went on apace, working in Norway, Holland, Singapore and Borneo. He then became a training supervisor mainly working offshore but also at the Aberdeen training facility. Eventually Jeff was offered a position as deck co-ordinator on the Britannia Platform, where he stayed for almost eight years, and he finally ended his offshore career working on the Brent Bravo platform during its decommissioning and dismantling. Jeff is very proud to have been amongst those eight men who were the bedrock of a company now so prominent in the offshore industry “SPARROWS”. ditching, off Shetland, involving the Super Puma AS332. Martin is recovering from the aches and pains caused by the accident but still having flashbacks of his very traumatic experience, we wish him a speedy recovery. The following statement is from Martin’s interview shortly after the incident with STV. Martin Tosh, 34, from Kintore, Aberdeenshire, a survivor of last week’s Super Puma helicopter crash off Shetland has said the aircraft filled with water in seconds after plunging into the North Sea. Martin said he thought he was about to die when the AS332 L2 ditched without warning last Friday evening. Mr Tosh, one of 18 people on board, was returning from the Total-operated Borgsten Dolphin platform at the end of his second voyage offshore. He said: “There was just a total loss of power and we ditched into the sea. It banked to the left and was in the sea. "The helicopter filled up extremely quickly. In less than 10 seconds the helicopter was full of water. "I was one of the last survivors out of the helicopter. I was petrified. We didn't get any 'brace, brace, brace'. "We didn't have time to put a mayday call out. It happened very quickly. There were no warnings at all. "It just happened instantly. One minute you were in the sky and the next there's water. Fighting for our lives to get out of the helicopter." The crash, off Fitful Head, near Sumburgh, claimed the lives of four offshore workers and raised new questions about the safety of the Super Puma fleet. My grandson was walking through Bath today and spotted this Sparrow crane, he took this picture with his camera and sent it straight to me, lovely to see the dynasty continues after all these years, the brothers would have been proud of this one, as I am.